Landlord Electrical Safety Certificate – Electrical Installation Condition Reports (EICR) for Rented Properties in Watford, Hemel Hemsptead, St. Albans and North West London. If you let property in England you must ensure that electrical equipment and the electrical system are safe and the best way to make sure of that is to have Electrical Safety Certificate issued by Professional & Approved Electrical Company. Elsys Electrical Ltd carry out visual inspection and all respective electrical tests for rented domestic properties. 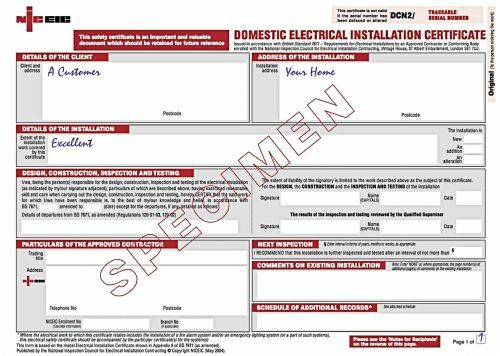 Letting property electrical inspection and testing needs to comply with BS7671, the 17th edition of the IEE wiring regulations. All rented property electrical inspection and testing work is fully documented and provides a full and independent report detailing the condition of the electrical installation in your rented property. The ‘Landlords Electrical Safety Certificate’ provide evidence of compliance with relevant legislation and are suitable for all domestic and commercial building. Annual visual inspections – recording this on a safety checklist. Inspections on tenant change of occupancy – recording electrical equipment, its condition and fuses fitted. 5 yearly periodic electrical inspections by a qualified electrician to ensure safety and that the electrical system complies with current electrical regulations. Keep all records of the inspections. This report is intended to be issued only for the purpose of reporting on the condition of an existing electrical installation. The report identifies any damage, deterioration and visually evident defects. All electrical inspection and testing work at rented properties on behalf of landlords is carried out by fully qualified and competent electricians. We are capable of providing our customers with NIC EIC Electrical Condition Inspection Report (ECIR) and Electrical Installation Certificate. Our electricians are qualified to the latest 17th Edition of the IEE wiring regulations and City and Guilds 2391. For more information please visit the Electrical Safety Council Guidance for Landlords webpage.